W8 Media Column in clear design with integrated display, selectable in 55“ or 65“, Plug & Play control system and audio package. W8 Media Column as fixed installation or mobil version with base plate available. 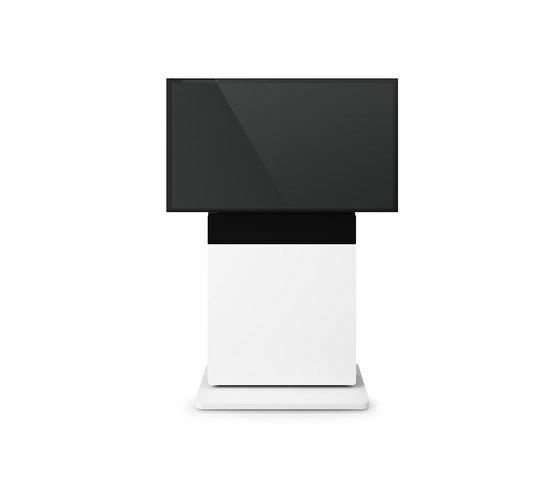 Corpus 1-piece in white or black finish with selectable door in lacquer or glass, for integration of speakers and mini-pc as well as technical components. Media column prepared for optional integration of a videoconferencing system or a webcam. W8 Media Column comes equipped with Plug & Play control panel as well as with a remote control, each of them have eight buttons. Integrated Plug & Play audio package with stereo amplifier and speakers. At Holzmedia, fine furniture meets multimedia technology.